Garlic is one of the easiest crops to grow. No matter where you live in the UK, so long as you have a weed-free, sunny spot and well-drained soil, you can grow garlic just by planting a single clove and waiting until a whole bulb is ready to harvest. Since ancient times, it has been known for its curative properties, and is used in almost every cuisine in the world. To some people, it is an indispensable cooking ingredient. These are attractive and useful perennials, also known as Chinese chives. The leaves taste like a cross between chives and mild garlic, and the flower heads can be used to decorate salads. They will grow in any well-drained soil or small containers. Sow the seed in spring, either indoors or in the ground in rows. Thin the plants to 15-20cm apart. In their first year, take a few leaves once the plants are 15cm high and do not allow them to flower. In the second year, the plants will form a clump and produce white flowers in late summer. The leaves die back in winter, but you could lift a plant out and pot it up for the kitchen windowsill. In milder areas, garlic can be planted now, if the soil is workable and not too wet. Loosen heavy or compacted soil. Plant out in colder areas as soon as the soil is in good condition. 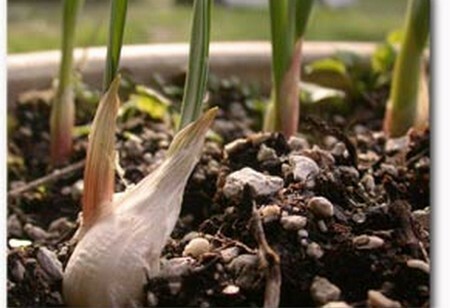 Separate the bulb into individual cloves and plant each one upright, with the flat base of the clove facing downwards. Push them at least 3cm down into the soil with no tip visible or birds will pull them up. Leave 10-25cm between each clove. The bigger the clove, the larger the space needed. Garlic requires little attention while it grows. All you need do is pull up any weeds that come up near the plants. If the weather is very dry, it is worth watering to encourage leaf growth, as this determines the size of the bulb. Bulbs should start to swell underground. As soon as the leaves turn yellow, harvest the garlic. If left, the bulbs might re-sprout and not store so well. Garlic can also be planted in autumn (late October to early November). Push the cloves in firmly so that they are not lifted out by early frost. Otherwise they need no attention and should be ready to harvest the following June or July.